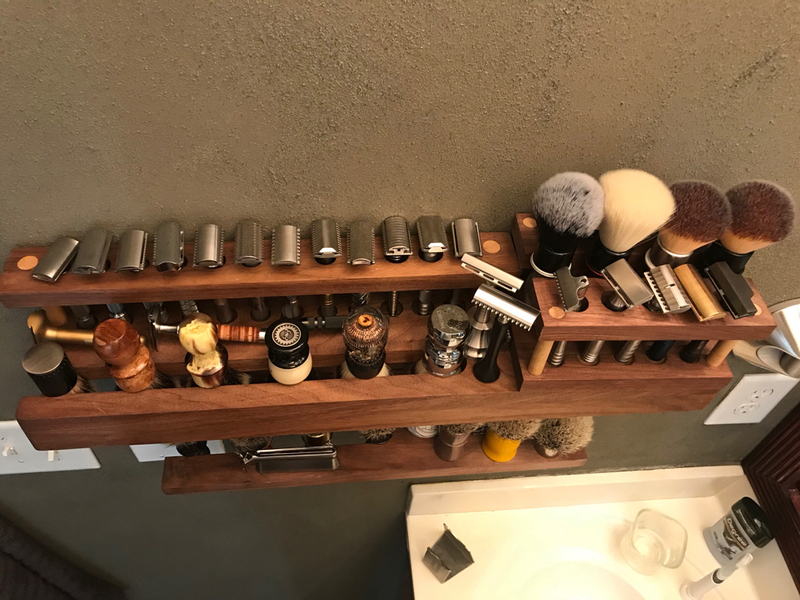 Richard at Richtercustoms shop on Etsy does great work on custom storage pieces for shaving gear. He did this one for me last year and a smaller piece. Now I am having him do a couple add-on pieces that will allow me to display more of my collection because of the current one being so crowded. 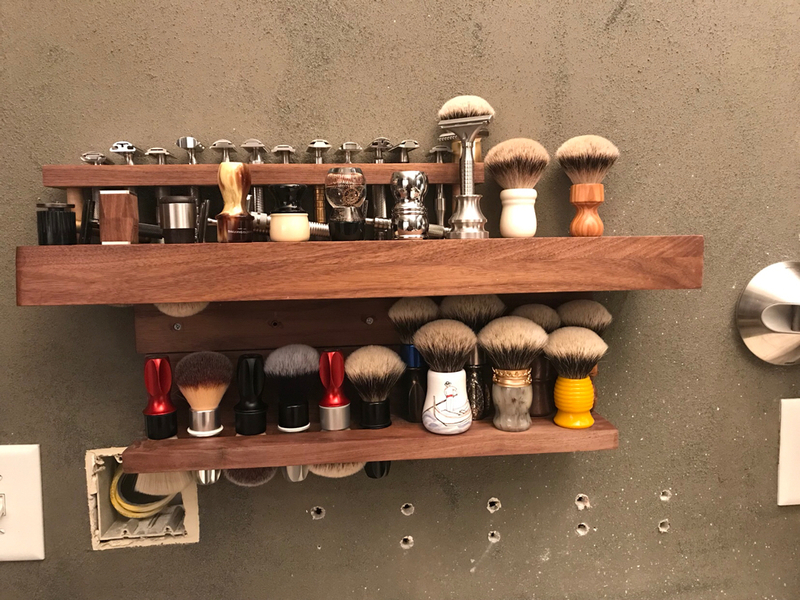 The new shelf will mount to the bottom wall piece and have another long slot for brushes and a portion that will be a solid shelf. 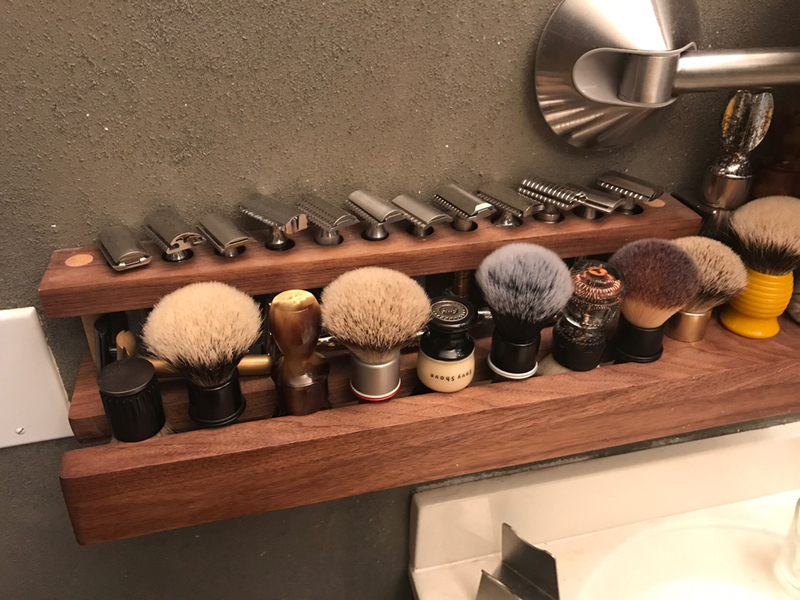 I'm also having him build another razor brush stand that will sit on the end where some of my current brushes are. He can be a bit difficult to communicate with through Etsy but once he understands what you want, he does a great job with it. A beautiful and practical piece of woodwork. 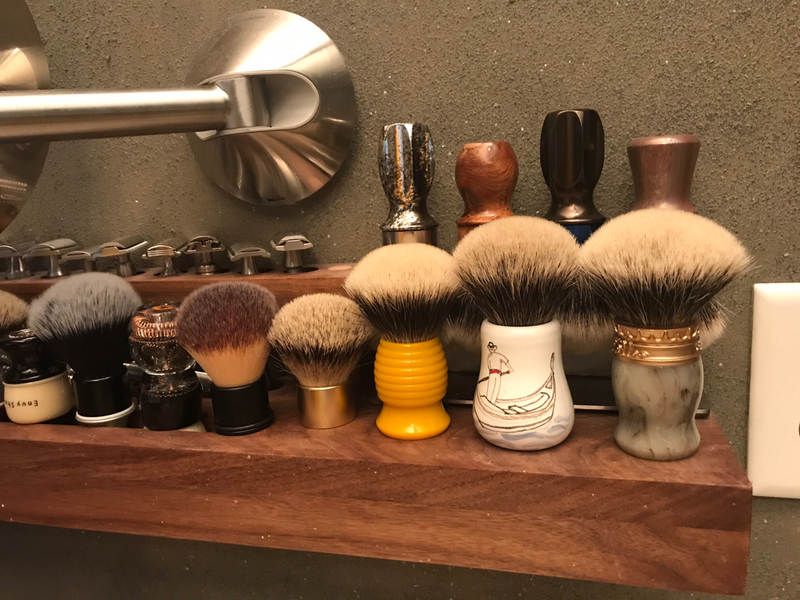 Are you concerned about your PantaRei brush falling off? Here’s a pic after adding the new bottom shelf that he made for me. 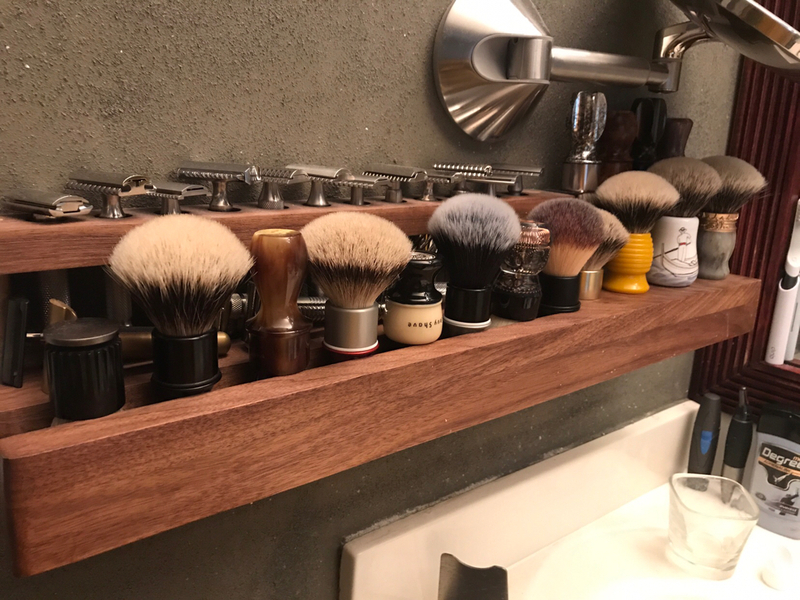 Waiting for one more piece to add to the upper end shelf. Now that’s have to fix the holes that I created when I mounted it the first time. (09-17-2017, 07:54 AM)TheLegalRazor Wrote: A beautiful and practical piece of woodwork. Not worried at all. Shelf is pretty level and sturdy. 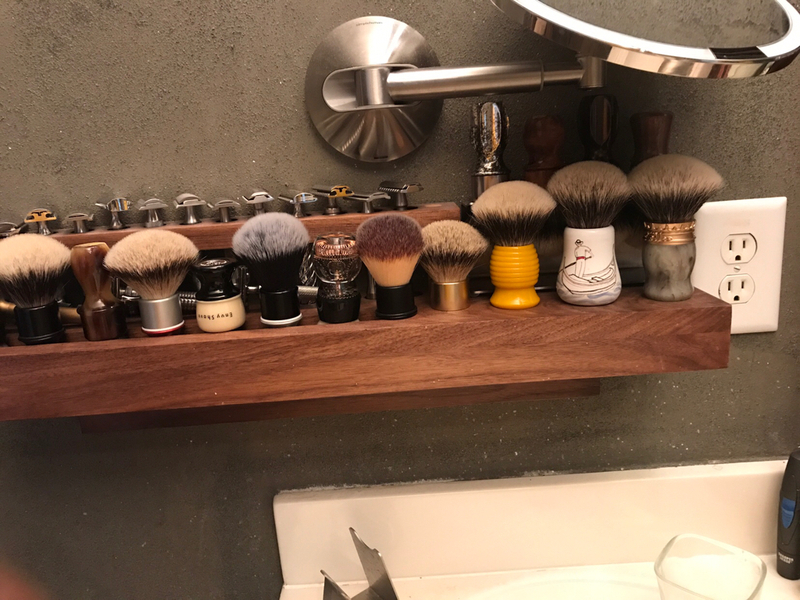 The unique brushes will be moved up to the top end shelf when the other piece comes. Great looking craftsmanship; Thanks for sharing! 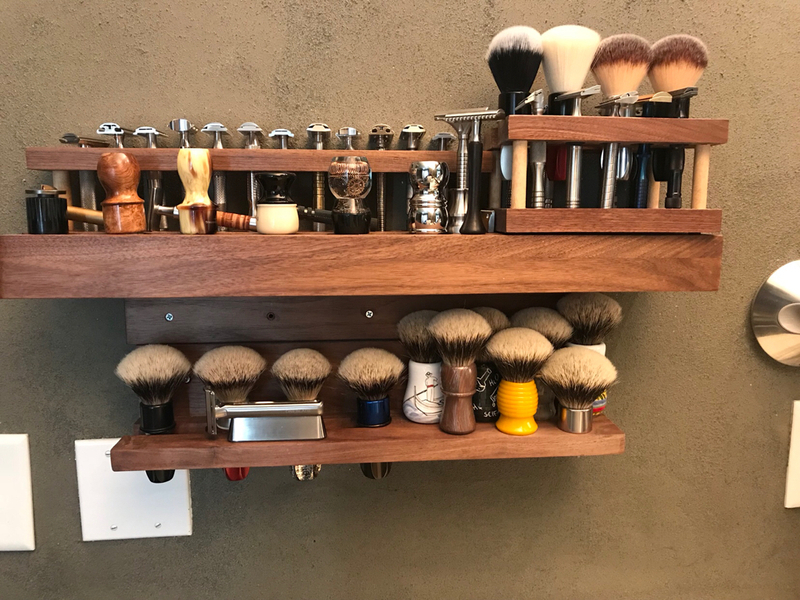 I contacted him several months ago to inquire about custom work on a multi DE razor stand and he said he wasn't taking any requests at the time. I liked his designs but had to go elsewhere. Waiting for the last end piece which will be delivered Monday or Tuesday. The extra bottom shelf turned out really nice and a fixed all of the holes. 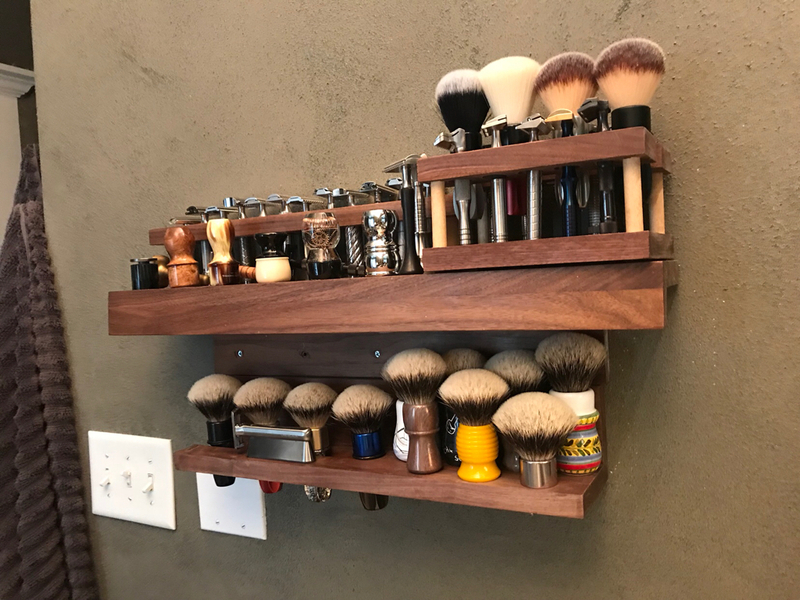 The end shelf piece for up top holds 10 more razors and has room for 4-5 brushes. I’ll send a new pic of the entire piece when I get the last piece. 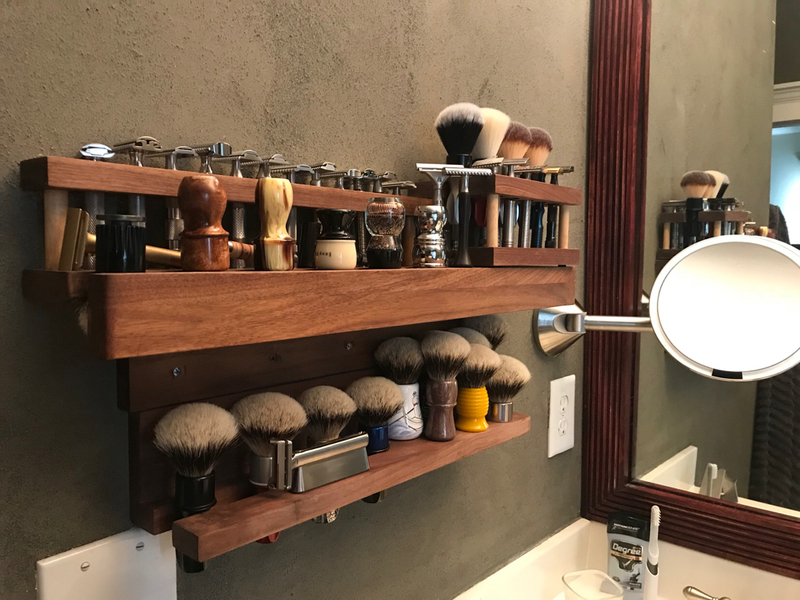 (10-08-2017, 01:01 PM)FloridaCreekIndian Wrote: I contacted him several months ago to inquire about custom work on a multi DE razor stand and he said he wasn't taking any requests at the time. I liked his designs but had to go elsewhere. You really have to stay on him to get stuff done and done right. He has difficulty communicating but he has done 4-5 pieces for me now so I was able to send him drawings of what I wanted and hound him until he got everything done. Finished product after repairing the holes in the wall and rearranging the collection. I forgot about this thread. Nothing to really stay on top of when someone doesn’t want to take on work. He was hard to get in touch with too. No worries. That shelf system does look nice though.